Within Teamwork Projects, you can set default task lists on your board columns. When a default list is set, any new tasks added to the associated column in board view will be added to the task list. Note: If you are using a modify task list trigger as well as a default task list, the trigger will override the default. 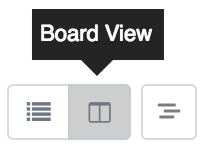 In your project, go to the Tasks tab and switch to board view. Hover over the name of the column and click the down arrow. Select Column Settings from the dropdown menu. In the column settings, you can then select a default list from your active task lists. Note: You can only add one task list as a default to a board column.